Money matters? Perspectives on Monetary Policy: Should the ECB go quantitative? Many commentators either complain that the European Central Bank has not followed the FED, the Bank of England and the Bank of Japan on the Quantitative Easing (QE) path of purchasing very large amounts of securities or, more kindly, advice the ECB to go that way, to more forcefully fight the risk of too low inflation . While I have not at all excluded that the ECB may have to do more to symmetrically respect its inflation objective , I have put QE on the bottom of the rank of measures the ECB could take, together with a negative deposit rate. In a previous post , I have explained the reasons for my assessment that a negative deposit rate is at the bottom of the list. In this post I want, instead, to give the reasons why I regard QE one of the least advisable measures for the ECB. In order to simplify and shorten my analysis, I will carry it out on a "differential" basis. This means that I will not consider the desirability of this course of action on an absolute basis, but as a difference with respect to the FED situation. This will spare me, and the reader, the effort of assessing whether the action of the FED to push down the long part of the yield curve through QE was both desirable and effective. In simpler terms, the point I address is: whatever are the merits of QE carried out by the FED, are there differences between the American and the €-area situation that advice the ECB not to follow the FED example? A look at the motivation of the FED in carrying out QE is a good starting point for the analysis. Basically, confronted with the zero lower bound and given the assumption that a negative interest rate would be needed to respect the dual mandate, the FED has purchased in 3 waves a huge amount of Treasuries and Mortgage Backed Securities (so far a total of around 2.4 trillion dollar). This should have lowered the yield on the purchased bond and pushed investors towards riskier assets through a portfolio balance effect. Huge purchases were needed given the liquidity of the Treasuries and MBS market. At a certain point the FED estimated in 9 basis points the effect of 100 billion purchases on the yield of 10 year treasuries . Compare these purchases with the outright purchases conducted by the ECB: the two covered bond purchase programs (60 and 16 billion respectively) and the Securities Market Program (SMP) (219 billion as of February 2012, when the programme turned inactive), for a total of 295 billion. Underlying the big quantitative difference in the purchased amounts (those of the FED are about 7 times larger than those of the ECB) there is a qualitative difference: ECB purchases were not targeting a reduction of long term yields but rather tried to remedy a market dysfunction, in the covered bond segment first and in the bonds of peripheral countries later. Much smaller amounts were not a consequence of timidity, but rather a sign of a different objective. Another important difference between the FED and the ECB is the lack in Europe of a market as liquid and efficient as that of the Treasury (and MBS) where the ECB could carry out its purchases. Many commentators suggest that this issue could be dealt with if the ECB would purchase a basket of bonds with weights derived from the capital key defining the ownership of the ECB by the different national central banks. Roughly, this would mean that the ECB should buy a basket composed for 60% by core countries bonds and for the complement by peripheral bonds. The sense of such purchases escapes me. The problem in Europe is not that yields are too high but rather the, decreasing but still prevailing, segmentation of the market. This segmentation produces too high yields on peripheral bonds and too low ones on core bonds. Given that, in any given jurisdiction, no investor is normally willing to fund a bank more cheaply than the government, the result is that bank funding, and thus bank loans, are much more expensive in the periphery than in the core: the spread is still of the order of 2 per cent between, say between lending extended by Italian-Spanish banks and that offered by German banks (based on covered bond iBoxx indices). This distortion is basically the "monetary transmission problem" that the ECB addressed first with the SMP and then, in a more effective way, with the Outright Monetary Transaction (OMT) program. The purchase of a huge amount of core bonds would further depress their yield and push interest rates even lower just where this is not needed. Symmetrically, buying large quantities of peripheral bonds, the ECB would basically kill the OMT: it does not make sense to promise to buy peripheral bonds in the future, if stress returns but subject to macroeconomic conditionality, when one would be already purchasing large amounts of peripheral bonds. The biggest loss in killing the OMT would be conditionality. This is the biggest improvement between the SMP, which had only a rough form of conditionality, and the OMT, which clearly conditions purchases to a macroeconomic adjustment program and thus deals with moral hazard problems and reinforces, on the fundamental side, the effect of the possible purchases. Of course the ECB could desire, consistently with its forward guidance, to lower, or at least avoid an increase, of money market rates across the €-area, but there are much more direct ways of doing this than carrying out a European version of QE: the ECB could increase excess liquidity, thus pushing again money market rates closer to zero, for instance by stopping to sterilize the liquidity created by the SMP, it could further lower the policy rate, it could offer a new very long term refinancing operation rolling over those that are gradually maturing , possibly with an interest rate cap which would guarantee a very low funding cost to banks and would give teeth to its forward guidance. In addition, if the ECB would want to make its financial intermediation more directly relevant for firms, especially small and medium sized ones, it could establish a program of Asset Backed Securities purchases. In conclusion, the situation of the ECB is very different from that of the FED and the ECB has much more targeted measures at its disposal if it wants to impart an additional easing bias to its monetary policy. Is the price stability target of the ECB at risk? 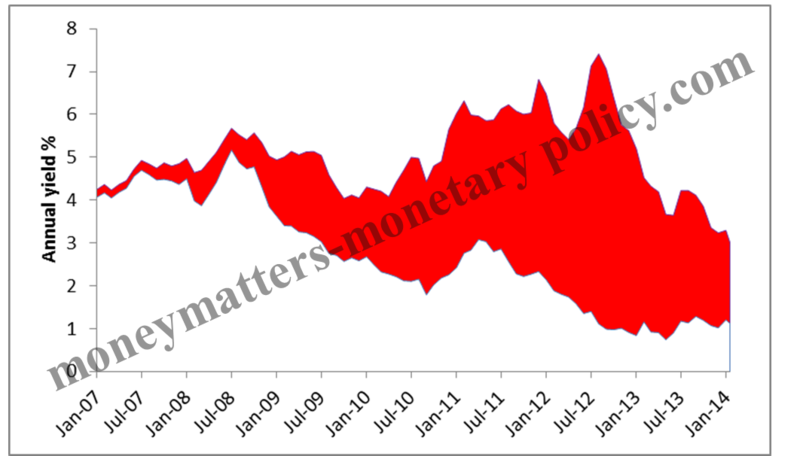 and € liquidity is getting more valuable: what can be done about it? Trust in Europe paid handsomely! Three liquidity scenarios after the year-end.